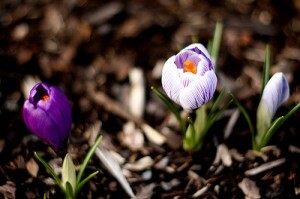 An early spring might bring crocuses in March. March comes in like a lion and goes out like a lamb, or so the old saying goes. The first part of the month can be frigid but as the days go on, temperatures start to edge above freezing. Don’t rule out a late storm though. There’s still plenty of snow so the ski slopes stay full and other winter activities like snowshoeing and snowmobiling are also an option. March also means the start of the maple syrup run. Go to a sugar woods and watch the sugary syrup being boiled down, then taste it over hot pancakes. Many community suppers serve up traditional feasts of pancakes and maple syrup plus baked beans, sausages and sweets. School lets out for March Break during the 3rd week of the month. On the upside, this means lots of planned activities for kids at museums and day camps run by community groups but expect places like ski hills and any hotel with a pool to be crowded during this week. Towards the end of the month, start looking for the first of the spring flowers like crocuses, peeking out from beneath the last of the snow.